Aberlour’s independent shops provide relaxed shopping with free parking nearby. It is a pleasure to browse the shops on the broad High Street, thoughtfully dotted with tea and coffee shops. If you’re looking for gifts, Perfect Scents has a range and you can buy candles or have a relaxing massage. In Three Bags Wool you can buy a range of beautiful yarns as well as local handmade textiles and sheep skin products. This shop has moved next to the Co-op in The Square and will incorporate a coffee shop in the newly named “The Gather’n Cafe”. Local art and crafts can also be found at the which has a wide range of Scottish art including original paintings, prints, pottery and gifts. A historical yet practical store is C.A. 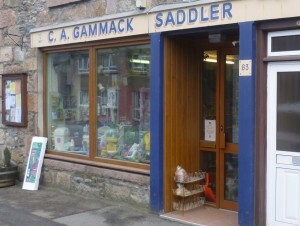 Gammack, established in 1857, where you can have a belt made to order, get your bridle fixed, or pick up some more conventional hardware goods. For the more practical requirements in life, the High Street also has a supermarket, pharmacy, butcher, garage, chinese carryout, newsagent, post office and a filling station.